To leave, or to stay? While Israeli PM Netanyahu calls for Jews to 'come home to Israel,' French leaders argue security will be ramped up to protect them. 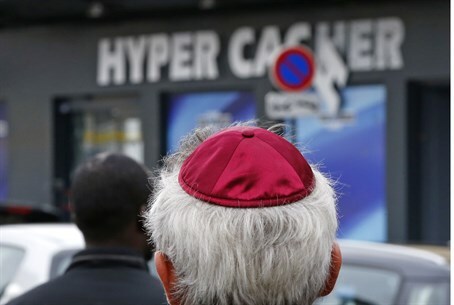 This week's deadly terrorist attacks have again set off a competition between the French and Israeli governments to reassure and secure the affection of France's increasingly nervous Jewish population. Not for the first time, Israel's Prime Minister Binyamin Netanyahu used an attack by Islamic terrorists in France to urge the country's Jews to relocate. "To all the Jews of France, all the Jews of Europe, I would like to say that Israel is not just the place in whose direction you pray, the state of Israel is your home," he said in a statement on Saturday. Responding from outside the Jewish supermarket in Paris where four hostages were murdered on Friday, French Prime Minister Manuel Valls sought to counter Netanyahu's words. "France, without its Jews, is not France," he said. "The Jews of France, for several years, have been frightened," he added, before trying to reassure them that "today, we are all Charlie, all police officers, all the Jews of France." Indeed, a spate of recent and violent anti-Semitic incidents had already left France's Jewish community - the third largest in the world at 500,000-600,000 - on edge. President Francois Hollande met leaders of the French Jewish community at the Elysee Palace on Sunday morning where he vowed to protect Jewish schools and synagogues with the army if necessary. Speaking after the meeting, Joel Mergui, president of Central Israelite Consistory of France, said: "We can't reproach any community for thinking about where to raise their children in security... but if France stands up for its democratic society that jihadists want to destroy... then Jews will certainly have fewer doubts about their future." Hollande also said he would visit the Grand Synagogue in Paris after Sunday's mass rally of national solidarity in memory of the 17 victims of last week's attacks including an assault on the satirical weekly Charlie Hebdo and the supermarket. Netanyahu is also slated to attend. Netanyahu will be among many world leaders attending the march on Sunday. The Israeli Prime Minister has tried to influence France's Jews to immigrate to Israel on a previous occasion, following attacks by Islamist Mohamed Merah in and around Toulouse in southwest France in March 2012. Merah killed three soldiers and four Jewish civilians, including three children at a school. During a visit to France for a commemoration service the following October, Netanyahu declared: "I always say to Jews wherever they are - come to Israel and make it your home." That triggered a war of words with Hollande, who slammed Netanyahu for turning the visit into a campaigning opportunity ahead of elections a few months later. "Netanyahu came to France to campaign," Hollande said in private remarks leaked by a French newspaper. "Since I was there, he toned down his speech but it wasn't good to transform this ceremony into an electoral meeting. It wasn't appropriate," Hollande said. Netanyahu did not get on much better with Hollande's right-wing predecessor. Nicholas Sarkozy was thought to have close ties with the Israeli leader, but unaware his microphone was switched on at a G20 meeting in November 2011, he was overheard telling US President Barack Obama: "I cannot bear Netanyahu, he's a liar."